Condition: We are offering for sale a really pretty late Depression Era 8 1/4" long glass knife. This awesome knife is in Undamaged Condition without chips, cracks, or mold damage. Most of the the knives found today are badly damaged. This one is in super nice condition. The grid is in good shape. Sometimes the grids are scuffed up. These old glass knives were sold by several different companies. This one was sold under the name Steelite. 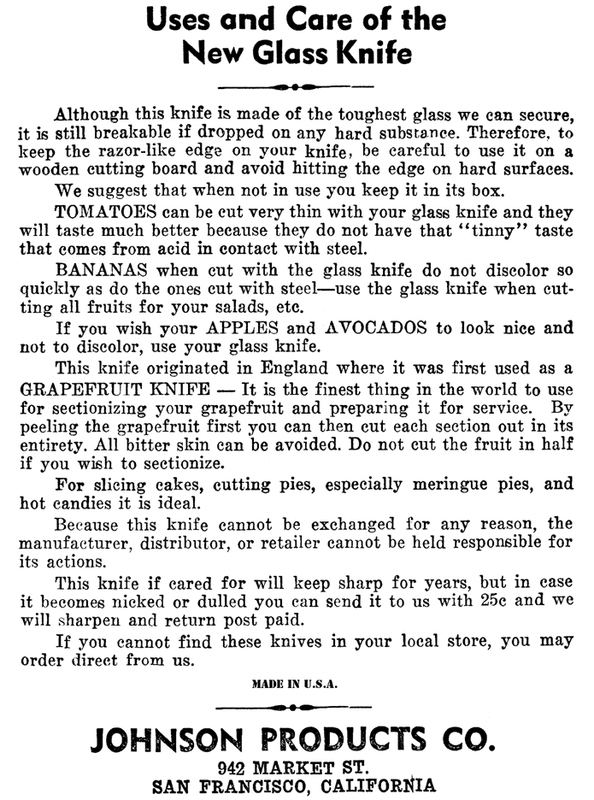 The instructions that came with these knives show Johnson Products Company of California was the distributor. The knife was made for them. We are not sure which Depression Era Glass Company made the knife, but we know it was made in the United States. If you love old Depression Glass kitchen items you will love adding this well preserved piece to your collection. We are showing the patent information on this knife, as well as the original instructions for use that came with one of my original boxed Steelite knives. These are not included wih this knife. They are for informational purposes only. Measurement: 8 1/4" L.- 1 1/2 W.
Condition: We are offering for sale a really pretty late Depression Era 8 1/4" long glass knife. This awesome knife is in Undamaged Condition without chips, cracks, or mold damage. Most of the the knives found today are badly damaged. This one is in super nice condition. The grid is in good shape. Sometimes the grids are scuffed up. These old glass knives were sold by several different companies. This one was sold under the name Steelite. The instructions that came with these knives show Johnson Products Company was the distributor. The knife was made for them. We are not sure which Depression Era Glass Company made the knife, but we know it was made in the United States. If you love old Depression Glass kitchen items you will love adding this well preserved piece to your collection. We are showing the patent information on this knife, as well as the original instructions for use that came with one of my original boxed Steelite knives. These are not included wih this knife. They are for informational purposes only.